The caregiver-patient relationship is a relationship that forms under tense and difficult conditions. The patient on the receiving end of care may be initially resistant to accepting help, or he or she may flat out refuse the help altogether. There are many barriers in the caregiver-patient relationship. However, this unique relationship can flourish once an emotional connection grows between both parties. In fact, it is this very connection that not only allows patients to receive the best quality of care but also goes on to have a direct influence on the patient’s health and well-being, thereby improving their quality of life. The emotional connection that is formed as the caregiver works alongside the patient creates mutual understanding between the two of them. One of the first benefits that begins to emerge from this emotional connection is that it facilitates open dialogue and communication between the caregiver and patient. This means that the patient feels comfortable discussing aspects of their care, what they need and how they can benefit most from the caregiver. Once a patient begins to see that their needs are being met, trust and even mutual respect begin to form. As mentioned, there are many barriers that can occur between the patient and caregiver; resistance to care and other negative emotions that patients may initially have toward their caregiver can put up walls and drain the caregiver’s resources. This can directly impact their ability to deliver the best quality of care. However, with a foundation of trust and respect that develops through open dialogue and over time, these barriers diminish. When these barriers are removed, it makes it possible for the patient to receive the best possible care because their time and energy is not being spent dealing with negative emotions. 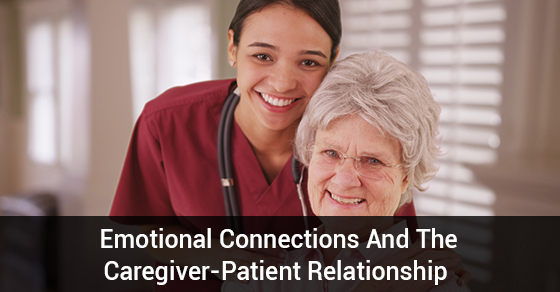 This emotional connection goes on to create a strong bond between the patient and caregiver. This is the foundation of high-quality care. It means that caregivers are invested in their patients; they want to see them thrive. They will go above and beyond when they care. Both patients and caregivers benefit mentally when they have emotional connections to others – it improves their quality of life. For many patients, their relationship to the caregiver is one of the few relationships in their lives. This strong bond goes on to influence their overall health and therefore also improves their quality of life. Our caregivers at C-Care Health Services are dedicated to providing compassionate care. Contact us today for more.